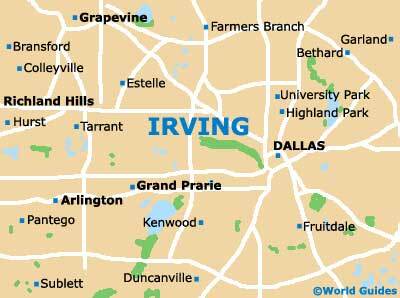 The city of Irving is filled with accommodation, much of which is really quite affordable and competitively priced when compared with other similarly sized Texan cities. 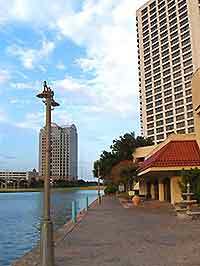 Few hotels stand in the city center as such, although particularly close to Irving are numerous nearby hotels, with many being found within the neighboring cities of Carrollton, Euless, Farmers Branch and Grand Prairie, as well as the major city of Dallas, which is full of lodging opportunities and approximately 12 miles / 19 miles away, to the southeast. There is plenty of accommodation to be found close to the Dallas Fort Worth International Airport (DFW), which is within easy reach of Irving city center and to the north-west. Chain hotels close to the airport are very much gathered along the West John Carpenter Freeway, where familiar brands include Best Western, Holiday Inn Express, La Quinta Inn, Sheraton, Super 8, Westin and Wyndham, amongst others. Budget hotels within the Irving area are concentrated around the Heathrow Drive, East John Carpenter Freeway and along the West Airport Freeway. Do bear in mind that the cheapest motels can be a little basic and what you pay will generally be reflected in the size of the room, the location and the available facilities. Very reasonably priced accommodation comes in the form of the two-star MainStay Suites on Imperial Drive, which is close to the Irving Mall and the Airport Freeway. On the far northerly outskirts of Irving and near to the North MacArthur Boulevard, the Homestead Hotel on Carnaby Street keeps its prices low by providing a limited housekeeping service. 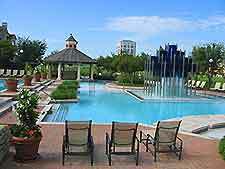 Much of the most popular mid-range lodging within Irving lies to the north of the city center, around Hidden Ridge, Love Drive and the West Las Colinas Boulevard, where the Marriott Las Colinas Hotel offers three-star accommodation. 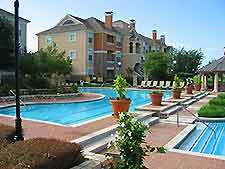 Standing on Green Park Drive, the Hyatt Place Las Colinas features very decent accommodation at affordable prices, as does the Nylo Dallas Las Colinas on West Royal Lane, which has trendy loft-style rooms. Luxury accommodation in Irving is far from widespread and there are only a handful of hotels that fall into this particular lodging category, with most being next door in the neighboring city of Dallas. One such Irving hotel is the four-star Omni Mandalay on the East Las Colinas Boulevard, next to Lake Caroline and within easy reach of the Galleria. For five-star lodging at its finest, the Four Seasons Resort and Club Dallas at Las Colinas is worth noting and is surrounded by stunning rolling North Texas countryside, where it features its very own 18-hole par-70 golf course, driving ranges and practice greens.